Looking for a WATERFRONT HOME on Lake BOWEN then you have got to see this one! The nicest level lot you will find on the lake. 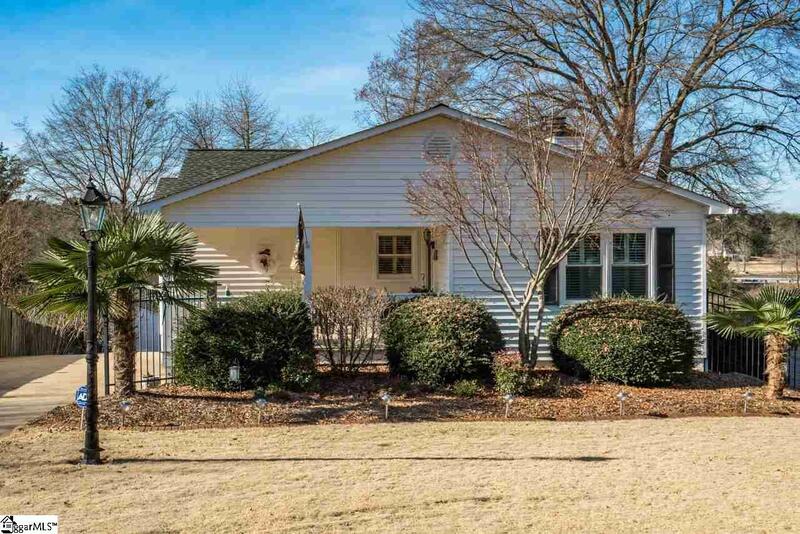 Beautiful updates in this one-level home with a finished walk-out basement. As you enter on this rocking chair front porch you come into an open floor plan. Very spacious Dining room area, the kitchen has gorgeous granite counter tops and ceramic tile backsplash with all the appliances staying including the refrigerator. The family room area is cozy with a gas-log fireplace and built-in shelving. There is also a remote projector screen that drops down from in front of the fireplace for your own media entertainment. There are hardwoods throughout this home, except for the baths and rec room downstairs, which are ceramic tile. The Master bedroom has a large walk-in closet and the master bath is gorgeous with a large whirlpool tub, double vanities and a large separate walk-in ceramic tile shower. Also, you can walk out to your screened in porch to drink your morning coffee while you look out at your beautiful waterfront views. But don&apos;t forget inside with the lovely sunroom with a large window seat! The basement level features a large rec area, the 2nd bedroom is very spacious with laminate wood flooring and a large full bath. There is a large walk-in Laundry room, a walkout to the patio and a covered two car carport. You will love the tankless hot water heater and so much more. This home is in immaculate condition with so many updates including the landscaping with palm trees, shrubs, trees, and a gated fenced front yard. But mostly you will love the LAKEFRONT living with your own personal dock and covered area for boat. The outbuildings will remain. Call today for your personal showing. Storage Space: Attic, Out Building, Out Building W/Elec.